Thread: What do you think of it so far? As it regards the Seiko VK64 module... after the chrono has been running for 60 minutes... does it continue to run (as with mechanical chronos) or does it automatically stop (to preserve battery life)? 1. Found to be locked? 2. Return the hands to zero (without first pressing "stop")? I'm trying to think if this is a good or bad thing. As a 'safety' feature it's good to have i guess. But then I also understand your follow up question as you won't necessarily know the state of the chronograph if it stops all dead on the zeros after an hour? The second question has nothing to do with the first question. 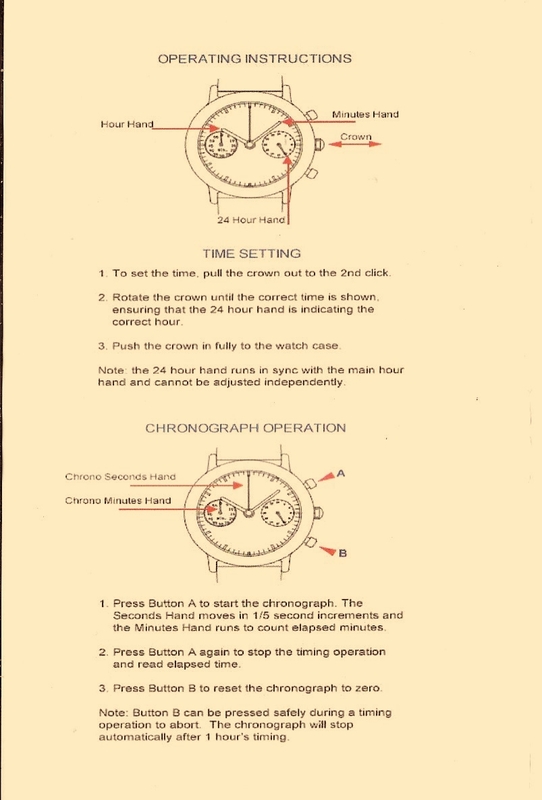 With mechanical chronos, while the chrono is running you cannot push the return button as it is locked. I have a Bulova quartz chrono and with the chrono running the return button is not locked and will zero the hands (while they are running). I was wondering if it is the same with the VK64. Hope this helps answer any questions you may have. As it happens, the original Blancpain (Eddie posted) was a real flyback. Last edited by abraxas; 20th January 2019 at 00:57. I wonder how much effort it would have been to make the movement a proper flyback. This half 'abort' version seems a bit in no man's land (IMO) at least. Not sure any full mechanical chronograph has this sort of 'abort' function? The "abort" appears to be a new thing. I have now seen it on two modules made by different manufacturers. I can see why it's sensible for the design: when you press the reset button, the first thing it does is disconnect the powering of the seconds hand if necessary. Then, when button is fully depressed, the mechanical element engages and returns the second hand. For the second hand to start moving again, the movement would have to take the release of the movement as an instruction to start. The problem here would be, how would the movement still have the information that it was running before the pusher was first engaged it? Whatever the solution to that would be, it would cost money, and half the point of this movement is that it is not expensive. Very nice, although I am not in the market for a chrono, but I especially like the bezel, very Blancpain 50 Fathoms. The Blancpain Air Commander of 1951 was the progenitor of both the 50 fathoms and the Type 20 chronograph design language. Now the new owners have had a chance to live with their new Aerotimers - what are peoples thoughts on the movement - is it nicer to use than a conventional quartz chronograph, any views on the accuracy v other quartz, are you missing the running seconds? All good here, I have a couple of watches without running seconds so not an issue for me. I've always preferred chronographs with 2 sub dials instead of 3. It seems like the chronographs with 3 sub dials are much more popular though, but the function of the 3rd dial is purely to tell AM or PM which seems a bit unnecessary. Yep its great, been wearing as daily when I am on the bike as my PRS-18 COSC is a bit to chunky on a Nato. Not missing the running seconds and seems to be keeping good time, very set and forget. Delighted to have had confirmation that mine should arrive tomorrow. It's my 1st new watch for a couple of years and really looking forward to seeing it in the flesh so to speak. Eventually got the opportunity to order the Aerotimer which arrived this morning; superb watch and for me best on the leather strap. Like with the recently released Newmark 6BB with the same movement, then a running second would have been nice but far from a show stopper.